To become a CSC volunteer, individuals apply for specific volunteer opportunities listed on our volunteer opportunities page. Cleveland Sight Center offers a wide range of volunteer opportunities. Some volunteers might record a textbook for a college student who is blind, narrate the details of a live theater performance or convert a restaurant menu to Braille. Our Volunteer Manager matches volunteers’ interests and skills with the specific needs of our clients and programs. For questions about volunteering with CSC please contact the volunteer office at 216-658-4581 or at mmauk@clevelandsightcenter.org. 1. View the Volunteer Opportunities page to browse and select an opportunity that suits your skills and interests. Click "Apply Now" under "Current Volunteer Opportunities" to apply for the position(s) of your choice. You must be 16 years of age or older to apply. Successful completion of background check is required for all volunteers. 2. After completing your application, sign up for a brief phone interview. You will receive a link to sign up for your interview in a confirmation email after submitting your online application. 3. Upon receiving an offer to be placed in a volunteer opportunity available at CSC, complete necessary forms and background check as instructed by CSC's Volunteer Manager. Participate in a volunteer orientation to Cleveland Sight Center. For more information, please contact Melissa via email mmauk@clevelandsightcenter.org or at 216-791-8118. 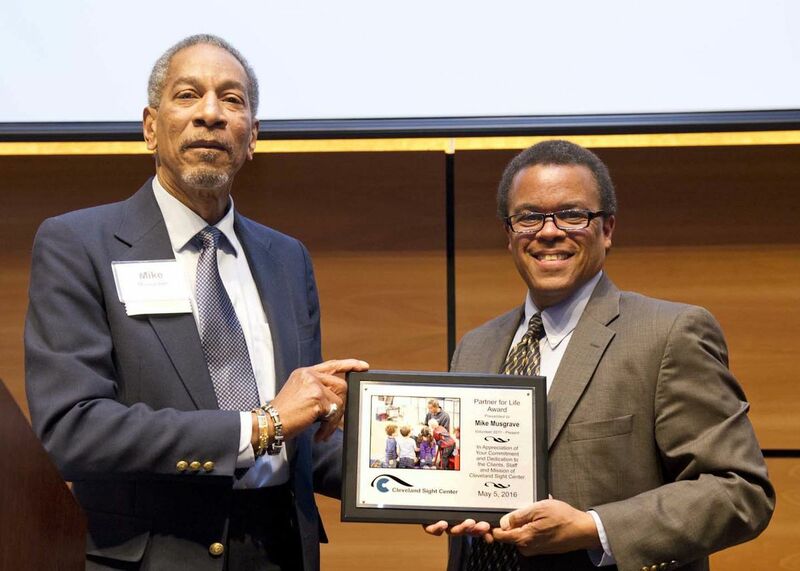 CSC recognized Volunteer Mike Musgrave as the agency's Partner for Life Award recipient. Mike has contributed 510 volunteer hours, the equivalent of 64 eight-hour work days; he is passionate, active, engaged and has a continued desire to learn; he is dedicated to Cleveland Sight Center; that is just a glimpse of the immeasurable impact volunteer Mike Musgrave made at CSC just during Fiscal Year 2015. Always in high demand, Mike spends his time reading to preschoolers, assisting the adult literacy program, serving as an ambassador at community and speaking engagements…the list is endless for this versatile volunteer. Thank you Mike! We appreciate all your incredible efforts! Mike Musgrave receiving his award from CSC President Larry Benders. A close-up of Mike's Partner for Life Award from CSC.